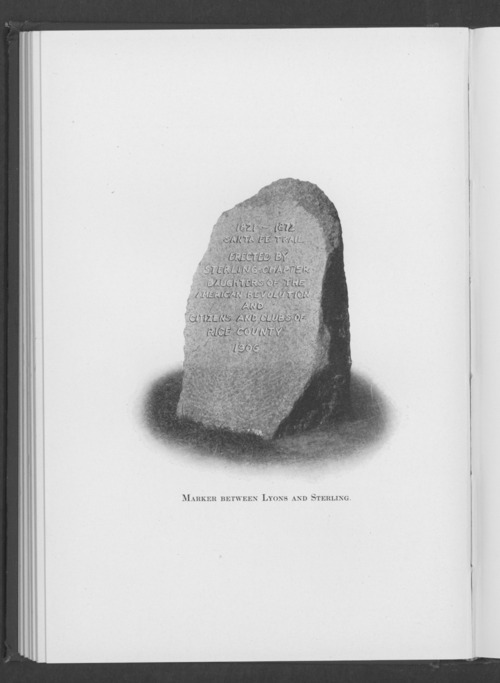 This black and white photograph from the book, "Marking the Santa Fe Trail", shows the granite marker in Rice County, Kansas. The 5,000 pound stone was placed on the main road between the towns of Sterling and Lyons (about one mile south of Lyons) where the Santa Fe Trail crossed the road. The Sterling chapter of the Daughters of the American Revolution erected the monument to honor the pioneers and soldiers who lost their lives along the trail.